For the last month I’ve been watching tons of amazing pictures bombarding Instagram from the Baja Divide route. This is a brand new route mapped out by Nicholas Carman and Lael Wilcox , and they held their first ever group start in January of this year. Ever since all those fat tires started rolling down the peninsula my social media accounts have been one great big reminder of how much I’m missing out. For most of us “average Joe” riders, we can’t take off weeks or months from our families and work to galavant across whole swathes of continents. I’ve found that I can become so frustrated with the limitations of my schedule that sometimes I won’t do a darn thing. If I can’t ride across an entire dang country, I might as well not get off the couch. Taking a quick break from the mud. In 2017, I’m making simplicity a focus of my everyday life. I’ve come to realize that more often than not, I miss out on adventure simply because I don’t put it down on my calendar. It’s OK to have modest adventures, it’s not OK to miss out all together because they’re not as grandiose as my imagination tells me they should be. I recently got out for a quick-but-wonderful overnight adventure in the desert washes of San Diego County, and I want to share a few helpful tips for the other regular, full-time job working, family raising guys and gals like me who may be stuck in an adventureless rut. My first tip for getting an adventure rolling is to just pick a date and stick with it. This seems almost too simple to be a tip, I know. So often I’ve found myself trying to juggle everyone else’s schedule that I never actually nail down a date, and time slips away. Instead of trying to appease everybody, pick a date that you’re happy with, let people know, and stick with it. Your buddies will rearrange their schedules or they won’t, it’s ok. Put out the date on social media, especially if you’re part of any local cycling groups. I’ve made some cool friends from guys who have jumped in on rides posted up on Facebook. Some of the tighter stretches of Sandstone Canyon. This winter has been an exceptionally wet one in Southern California. This is my sixth winter here in San Diego, and I’ve never seen anything like it. Some friends and I had been itching to get out on an overnight to help prep for a longer trip we’re planning this Spring, but with the super wet conditions in our local mountains the only option we had was to head out to the desert. After researching several areas in our local deserts, I decided on a well known spot called Fish Creek Wash. Fish Creek is a popular destination with off-roaders, and although I had never been there myself I felt confident it would be a great spot for an easy overnight. 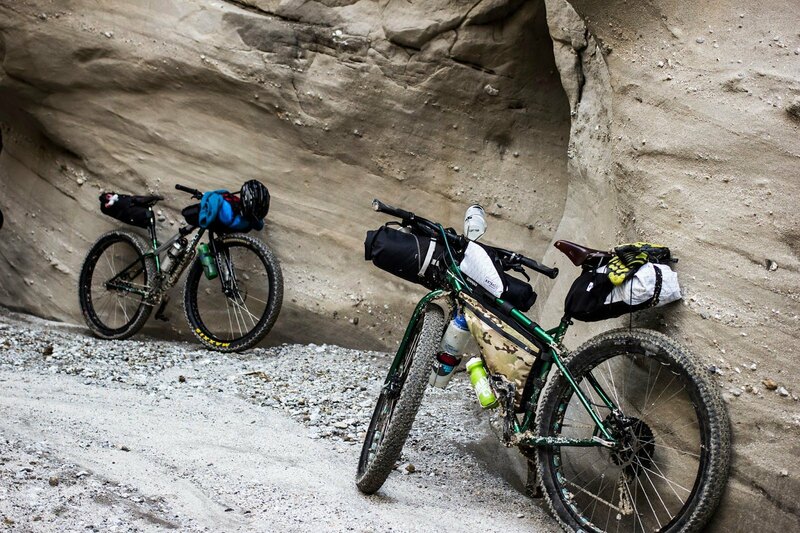 Bikepacking is an intimidating sport, and there are a lot of unknowns for riders who have never been before. 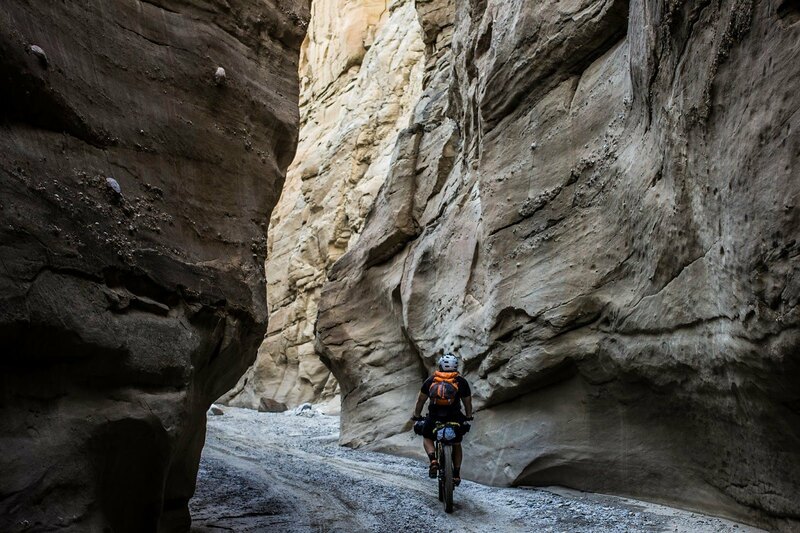 You don’t need to choose a route that will have your knees buckling, especially if you’re bringing newer riders. One of the great things about Fish Creek was that there was no real “destination” and we were riding it as an out and back. That meant we could stop and camp at any point; no mileage to hit, no expectations, just ride till you’re tired and stop. I created a GPX route that had us climbing the length of Fish Creek and camping in a high desert pinyon forest. I had marked the entrance to a side canyon on my GPS as a possible point to explore another area, but I could tell as soon as we got there that it had become the destination in itself. I could have rallied the troops and insisted that we keep climbing the main wash to our original end point, but we had way too much fun exploring this beautiful little side canyon. In the end we rode up the canyon as far as our legs felt like carrying us, found a small little patch of level ground and made camp. The spontaneity and exploration made it all the more enjoyable. I’m a pretty busy guy, and most everybody I know is at least as busy as I am. Sometimes the stars align and we can get a group together for an overnight, and sometimes they don’t. Get comfortable riding and camping by yourself. If you’ve never done it, it’s worth a shot. For me, it’s been a stretching experience. There’s nobody there to double check navigation with, nobody there to assure you those reflective eyes aren’t a mountain lion. You never realize how long a day is until you spend it by yourself; no friends, no phone, no distraction. Photography is an important hobby to me, so it comes natural for me to gravitate towards taking lots of pictures on trips like this. I go so far as to carry a full DSLR digital camera, tripod, and often carry extra lenses, remotes, etc. Night time is long in the desert, and I’ve found one of the most fun and engaging ways to spend the dark hours is to practice night photography techniques with the other guys on the trip. However, you don’t need to be an aspiring photographer to document your trip. Just bring a cell phone or a small point and shoot if you don’t want the weight, but make sure you slow down enough to capture the important moments of your trip. Bikepacking is still a fledgling sport in the big scheme of things. Tons of people out there are hungry for more information, techniques, setups, and routes. Even if you’re new to the sport, share your experiences with others so you can learn together. I’ve noticed people who are really timid about joining a trip feel way more comfortable after they see the pictures of past adventures, and realize it may not be so intimidating after all. Brian watching the moon rise. Fish Creek Wash is located in Anza-Borrego State Park. From Ocotillo Wells on Highway 78, head South on Split Mountain Road for about 8 miles until you come to the turn off for Fish Creek Wash. You can either leave your car at the bottom or drive about a mile up to the Fish Creek Primitive Campground, which is free to leave your car at overnight (this is an unpaved desert wash, high clearance vehicles preferred). Despite this being a desert ride the area had recently received a good amount of rain before our arrival. We slogged through thick, sandy mud for sixteen miles (all uphill) the first day. If you’re planning on riding out here after rain, try to give it at least a full day to dry out. I suggest anybody planning to ride this area be on at least 2.8” tires due to the deep sand. 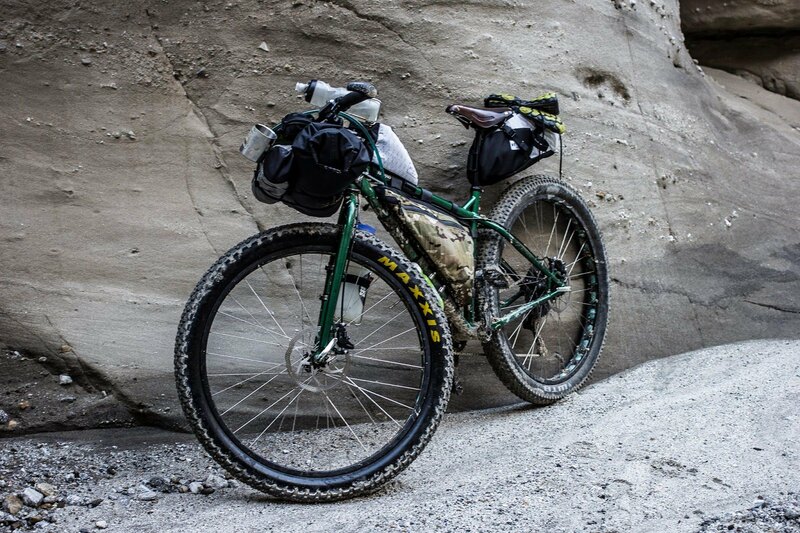 Surly Krapuses with 29×3.0 tires proved to be great rigs for this journey. There are plenty of areas to make camp along the way, and very few restrictions for camping. However, ground fires are not permitted in Anza-Borrego State Park without a metal ground cover. We camped near the top of Sandstone Canyon (marked by a sign at the entrance). This is a beautiful, narrow slot canyon that few jeeps can drive up. If the area is crowded, the top section of Sandstone Canyon is a great place to find some solace. Finally, if you’re looking for GPX routes of the area, there are plenty of routes available on ridewithgps.com. Load one up and get out for a ride! I went on my first real mountain bike ride in 9th grade. I remember I had never felt so much pain in my life. I stood on the side of the trail, almost in tears from my effort... then the trail pointed back down. I was instantly hooked, and bikes have been a huge part of my life ever since. I love the freedom of covering ground on my bike, and I happen to love trying out new and unique gear. My current fleet consists of a Surly Krampus, a Surly Karate Monkey set up as a rigid single speed, and a Salsa Colossal.